Spritz cookies are crisp, buttery and delicious. A holiday classic, they are easy to make and pretty. This recipe is from my dear friend Rita Symczyk, who passed away about 20 years ago. She was a great cook and baker. I have some of her recipes and every one is excellent (I wish I had asked for more). Her recipes have become my family’s favorites too and I make them over and over again. I converted her wheat recipe into a gluten free version. When you make Spritz or press cookies you use a cookie press that comes with many designs to choose from. Not all designs are easy to work with. It is easy to change the design disk if one is not working well for you. The first cookie rarely come out of the press well. 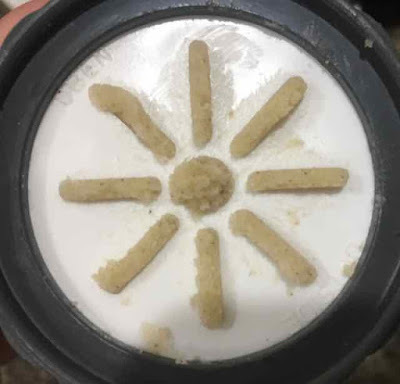 My advice is to try two or three cookies from a design disk and if it is not working easily for you change the disk until you find one that you just press and get a well formed cookie with one squeeze of the trigger. Use the dough right after it is mixed. No need to chill it as it presses more easily at room temperature. You must use an ungreased metal cookie sheet or the cookies will not stick to the pan when you press the dough out. Immediately after baking you should use a thin spatula to carefully and gently move the cookies to a rack to cool. If the cookies cool on the pan they will stick and be harder to remove without breakage. Also you do not want the edges to get brown so removing them from the pan right away keeps the cookies from baking any longer. If you like, you can decorate the cookies before baking with colored sugar, chocolate chips, nuts, sprinkles, candied cherries, etc. If you like you can make sandwich cookies by spreading a jam or chocolate filling on one side and topping with another cookie with the bottoms of the cookies facing each other. Once the cookies are cool they are sturdy and easy to work with. The cookie press is not expensive and you can use it to make savory crackers too. Makes about 60 cookies depending upon the size of the cookies. 1) Preheat oven to 375℉. Use ungreased metal baking sheets. 2) In a large bowl or the bowl of an electric mixer cream the butter and sugar until fluffy. 3) Add the egg and almond extract and mix well. 4) In a separate bowl add all the flours, xanthan gum, salt and baking powder and mix well. All at once add the flour mixture to butter mixture and mix until well blended. 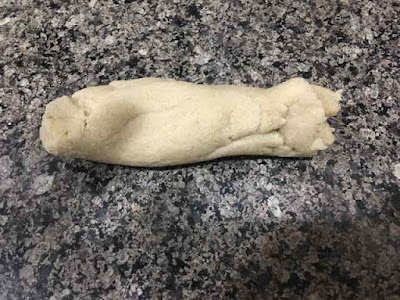 5) Take about ¾ cup of dough and form into a log narrow enough to fit into the cookie press. Add more dough to fill the press to just below the threads where the cap fits. Choose a disk place it into the end cap and screw the cap onto the cookie press. Squeeze the trigger until the dough starts to peek out of the disk holes. Dough rolled into a log to fit into the press. Log of dough in the press. I add more dough to fill it to where the cap threads begin. This is the disk I used for the cookies. It was very easy to work with. 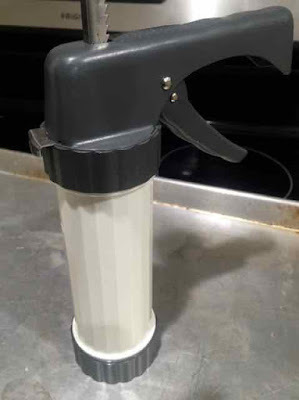 6) Place the cookie press onto the cookie sheet and press the trigger. The first cookie rarely comes out well. Just put that dough back in the bowl and press out another cookie. Press out the cookies of same shape on each cookie sheet so that they will bake evenly. They will not spread, but leave about 1 ½ - 2 inches between cookies. Raw dough pressed out onto the bare metal baking sheet. The cookie press should be flat on the cookie sheet when you press the trigger. 7) If desired, decorate the raw cookie dough with sprinkles, colored sugar, candied fruits, chocolate chips, etc. 8) Bake for 9-12 minutes depending upon your oven. 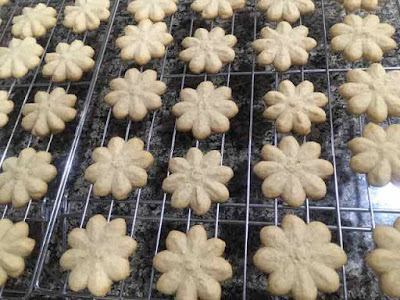 The cookies should be set and cooked but the edges should not brown. The bottoms will be lightly golden. 9) Remove the baked cookies immediately to a rack to cool. Use a thin spatula and be careful and gentle. If the cookies cool on the baking sheets they will stick and be harder to remove without breaking. They will also continue to cook and get browner if left on the cookie sheets. 10)I store the cookies at room temperature in wax paper lined tins. They keep for 2-3 weeks. You can freeze them for longer storage. 11)If you like you can make sandwich cookies with the baked cookies by spreading a jam or chocolate filling on one side and topping with another cookie with the bottoms of the cookies facing each other. Once the cookies are cool they are sturdy and easy to work with. 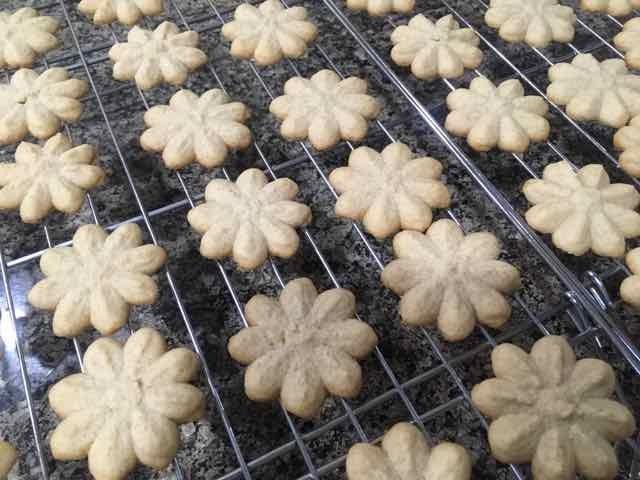 GLUTEN FREE SPRITZ COOKIES Makes about 60 cookies depending upon the size of the cookies. 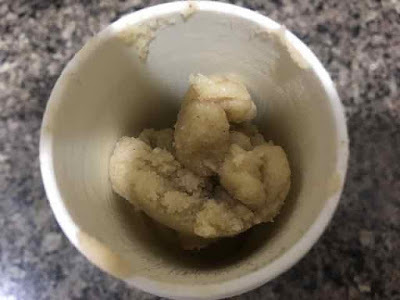 INGREDIENTS 1 cup/8 oz. Unsalted Butter ¾ cup Sugar 1 large Egg 1 tsp. Almond Extract 1 ¼ cup Sorghum Flour ½ cup Tapioca Flour ¼ cup Chickpea Flour ¼ cup Coconut Flour ½ tsp. Xanthan Gum 1 tsp. Baking Powder ¼ tsp. Salt DIRECTIONS 1) Preheat oven to 375℉. Use ungreased metal baking sheets. 2) In a large bowl or the bowl of an electric mixer cream the butter and sugar until fluffy. 3) Add the egg and almond extract and mix well. 4) In a separate bowl add all the flours, xanthan gum, salt and baking powder and mix well. All at once add the flour mixture to butter mixture and mix until well blended. 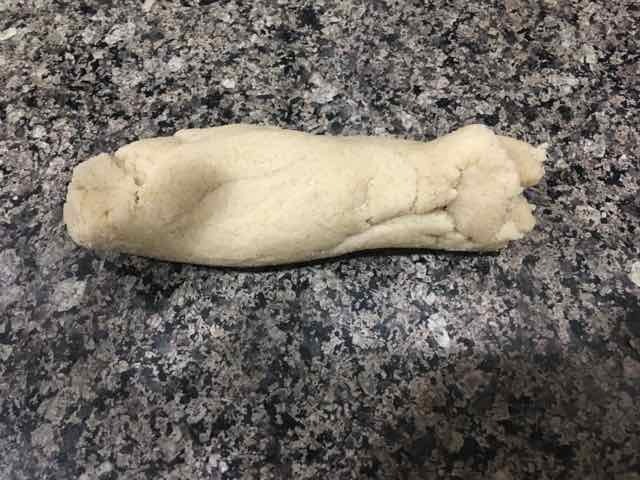 5) Take about ¾ cup of dough and form into a log narrow enough to fit into the cookie press. Add more dough to fill the press to just below the threads where the cap fits. Choose a disk place it into the end cap and screw the cap onto the cookie press. Squeeze the trigger until the dough starts to peek out of the disk holes. 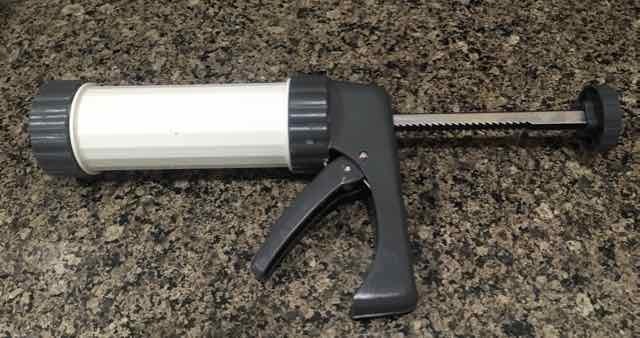 6) Place the cookie press onto the cookie sheet and press the trigger. The first cookie rarely comes out well. 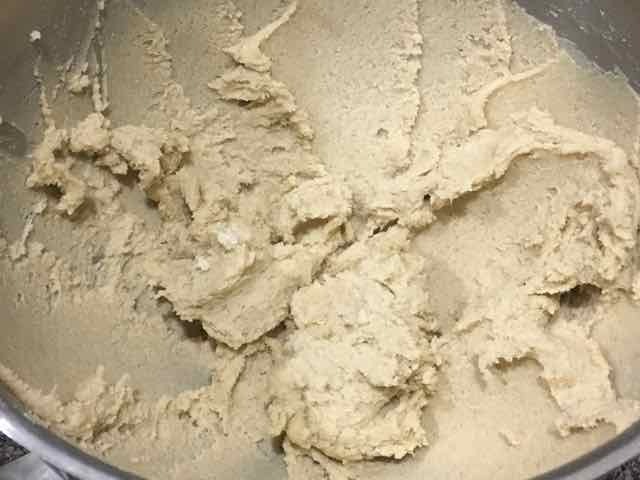 Just put that dough back in the bowl and press out another cookie. 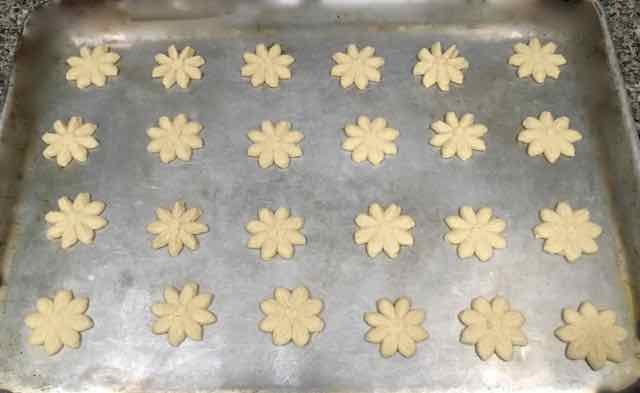 Press out the cookies of same shape on each cookie sheet so that they will bake evenly. They will not spread, but leave about 1 ½ - 2 inches between cookies. 7) If desired, decorate the raw cookie dough with sprinkles, colored sugar, candied fruits, chocolate chips, etc. 8) Bake for 9-12 minutes depending upon your oven. The cookies should be set and cooked but the edges should not brown. The bottoms will be lightly golden. 9) Remove the baked cookies immediately to a rack to cool. Use a thin spatula and be careful and gentle. If the cookies cool on the baking sheets they will stick and be harder to remove without breaking. They will also continue to cook and get browner if left on the cookie sheets. 10) I store the cookies at room temperature in wax paper lined tins. They keep for 2-3 weeks. You can freeze them for longer storage. 11) If you like you can make sandwich cookies with the baked cookies by spreading a jam or chocolate filling on one side and topping with another cookie with the bottoms of the cookies facing each other. Once the cookies are cool they are sturdy and easy to work with.